If you're reading this column, it's likely you're interested in learning and working in large format photography. And where does one start? Well, there are many places. Books are the obvious, followed by magazines, Websites with discussion forums, personal/professional Websites, and information Websites, good old fashioned stores, and local clubs or organization. I'll summarize the ones I've found worthwhile to keep going back to learn more. First, books. There are only a handful dedicated to large format photography, but they're really good resources to buy, obviously read, and always keep handy. These are, "A User's Guide to the View Camera", by Jim Stone, "Using the View Camera", by Steve Simmons, "View Camera Technique", by Leslie Strobel, and "Large Format Nature Photography", by Jack Dykinga. There are other books on the different types of photography which have information about 4x5 cameras or can translate the techniques to large format photography. Once you get into large format photography you will need to learn the Zone system. Sorry, it's one of the realities of it, along with the Schiempflug Rule. The Zone System allows you to get the proper exposure, and some books on it are "Zone System", by Brian Lev and "Beyond the Zone System", by Phil Davis. There are other books which include descriptions of the Zone System as well as many on-line resources. Go to any books store and there many photography magazines, mostly on digital photography, nature photography or Fine Art photography. There are really three magazines you need to read. One, "View Camera" focuses just on large format cameras, equipment and photography. The other one, Lenswork, is a Fine Art magazine which shows portfolios of photographer as well as articles on the various aspects involved in photography. The last one is "Photo Techniques" which is more the technical side of traditional and digital printing, but includes articles on cameras, equipment, and methods. Do a Google search and you'll find many Websites on large format photography, but the two I recommend are Photo.net with information, tutorials and a discusion forum and Large Format Photography, which has tons of information and tutorials, and a great discussion forum. The three magazines also have Websites, LensWork, View Camera, and Photo Techniques. Other, and often overlooked resources are local shops and clubs. You have to research what's available in your area. Stores that sell large format cameras, lenses and equipment usually have a longtime experienced photographer who will often be glad to help answer your questions, and often set a camera up for you. 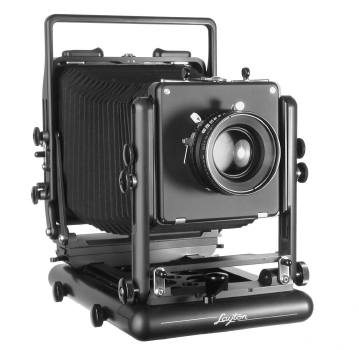 Organizations and clubs are often hit or miss, but usually every large city has one club specializing in large format photography and many smaller clubs have individuals working in large format photography. In the end, there are tons of resources to help you, and I've found almost every large format photographer are generous with their time and help, when they can. Remember most do this as part of their commercial or professoional photography or are part-time photographers with other fulltime jobs.